Jacqueline Bisset (born Winifred Jacqueline Fraser-Bisset on September 13, 1944) is an English actress. 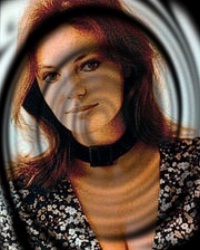 Bisset was born in Weybridge, Surrey, England to Max Fraser-Bisset, a Scottish general practitioner, and the former Arlette Alexander, a lawyer of French and English descent; Bisset's mother cycled from Paris and boarded a British troop transport to escape the Germans during World War II. Bisset has a brother, Max Bisset's mother taught her to speak French fluently and she was educated at the Lycée Français Charles de Gaulle in London. When Bisset was a teenager, her mother was diagnosed with disseminating sclerosis. Bisset's parents divorced in 1968, after 28 years of marriage. Bisset moved in to help her mother. She had taken ballet lessons as a child and now began taking acting lessons and fashion modeling to pay for them. In 1967, Bisset was cast in the movie Two for the Road. Next, she participated in the James Bond satire, Casino Royale (1967), as Miss Goodthighs. In 1968, Mia Farrow dropped out of the movie The Detective (1968), and the role went to Bisset. That same year, she was cast opposite Steve McQueen in Bullitt, and appeared in the 1970 disaster film Airport. By 1978, she was a household name. She earned her first Golden Globe nomination for the comedy Who Is Killing the Great Chefs of Europe? Soon thereafter, she played in the movies Rich and Famous (1981) with Candice Bergen, and Under the Volcano with Albert Finney (1984), for which she earned her a second Golden Globe nomination. In 1996, she was nominated for a César Award, France's version of the Oscars, for her role in La Cérémonie. Bisset has worked with directors such as François Truffaut, John Huston, George Cukor, and Roman Polanski. Several of her movies are French or Italian productions. Bisset has appeared in made-for-TV movies, especially during the past 10 years. One of her later TV movies, in 2003, was America's Prince: The John F. Kennedy Jr. Story, in which she portrayed Jacqueline Bouvier Kennedy Onassis. Bisset's most recent television work was a recurring role as the mysterious James, during the fourth season of the FX series Nip/Tuck.